Get that Tropical look with Beautiful Banana Plants. Banana Plants, Now on Sale 55% off. Grow your own Delicious Bananas anywhere with a sun room, greenhouse or outside. Get 2 Free fertilizer spikes with each plant and easy growing information. The Shipping is fast, 2 to 3 days by Priority Mail and is only $11.95 for shipping the entire order and usually ships within 24 hours. Great Service and Beautiful Plants guaranteed to arrive. Always Buy Tissue Cultured Banana plants only, never buy Corms or Bulbs. All commercial Banana growers all over the world use only tissue cultured plants because they are disease free and will produce the most bananas. We have banana plants grown from healthy Tissue Culture Clones. The way commercial growers grow plantations. It is the only way to get disease free healthy banana plants. Sold at the perfect size to get them growing fast. Banana plant growing instructions is included. Get fast and friendly growing advise if needed, by email, anytime. Each banana plant pollinates itself. Banana Plants will not cross pollinate each other. Many types can be grown together with delicious results. Banana plants grow great in a greenhouse at any location and can be grown indoors threw the Winter or year round and outdoors. They love hot weather. And most importantly, they give you lots of bananas. Recent Feedback - THE TWO DOLLAR MISTAKE. Let me tell you about Ted and his plants. I always shop around and I purchase from two other Company's and when I got my plants all in it was as different as night and day the other plants look sick next to Ted's. The others were a joke for the two dollars I save it will take months for the others to look any where next to Ted's and they will never catch up!!!! WOW He is a five star rating If you would like to see pics of the plants compare to Ted's email me at pukzpukz@yahoo.com The others don't even come close J D Cameron LA. Apple banana tree - Dessert type banana tree, pleasant apple flavor when fully ripe. Fruit: 4 to 6 inches. The size and quality of this banana tree makes it one of the worlds best eating bananas as well as one of the best dessert bananas. Very thin skinned when ripe and super flavor. Excellent banana tree for container growing as in the ground. Nice looking too. Mature Height: 12', Zones 8-11, Beautiful plants 14" shipped. "California Gold" - a real cold hardy fruit producer. Exceptionally frost hardy compared to other bananas, produces good fruit, year after year, without any frost protection. Only a few banana plants might equal the cold hardiness of California Gold, such as the inedible Japanese fiber banana Musa basjoo. The California Gold banana shakes off the cold. It may lose its' leaves after a hard freeze, but then continues to grow when the weather warms in the spring. The leaves lost during the winter don't seem to slow this plant down. California Gold have produced tasty bananas outdoors during the summer after enduring winter low temp in the low 20?s! These plants should be able grow fine in USDA zone 7 and above as an outdoor plant. The mature plant gets to 10' to 12'; depending on light and fertilizer. Some plants have produced fruit in as early as 10 months from a pup. Delicious fruits rival any store bought fruit in quality and flavor. Beautiful plants 12"to 14" tall shipped. Dwarf Cavendish Banana tree is sometimes called the Texas Star or 'Carolina King' ....the Dwarf Cavendish gets 5 to 6 ft. and produces wonderful sweet tasting fruit. A vigorous commercial type banana tree with wide green leaves. One of the more common banana plant varieties in the USA. It is often seen container grown in back yards and botanical gardens alike. These banana trees have large bunches of almost full sized sweet smooth fruit. Will take short 20 degree freezes easily. Grows in Zones 7-11. A vigorous banana tree with wider green leaves. The most popular greenhouse banana, will bear bunches with up to 90 bananas, each slightly shorter than the “grocery store” varieties. Juvenile leaves will have some reddish-purple markings, but later leaves will be all green. It is often seen container grown in back yards and botanical gardens alike. Beautiful plants 12"+ tall shipped. Musa 'Dwarf Green' is a strudy plant with extremely thick leaves. The thick leaves make this cultivar very wind tolerant. This is a cavendish type banana that produces a creamy orange pulp fruit. 'Dwarf Green' grows excellent cooking leaves that can be used for wrapping and grilling meat, as well as serving food. Fast Growing, Heat Tolerant, Cold Tolerant, Wind Tolerant. HEIGHT: gets 6 Feet, Full Sun, Partial Sun ZONE: 9-11, Thick Green Leaves, Wind Tolerant, Creamy Orange Pulp Fruit, Cook With Leaves. Beautiful 12"+ plants now. Musa 'Dwarf Namwa' known as 'Pisang Awak' and other names through out the world, this group of lady finger bananas produce large sized bunches of sweet delicious fruit that is prized in the Indonesian areas as well as the U.S. "Lady Finger" Fruit, Dessert & Cooking Banana, Delicious Fruit, Fast Growing, Heat Tolerant, Cold Tolerant, Full Sun or Partial Sun. Grows: 8-10 Feet, Outside zone :9-11, Beautiful 12" plants shipped. Outstanding banana variety that is the current commercial variety ('Chiquita') from Central America. 'Grand Nain' grows from 6 to 8 feet tall and produces large racemes of fruit. Bunches of fruit may weigh up to 150 lbs. (50 lbs. in the U.S.). Very attractive for landscaping potential and good wind resistance. Can be used as a container plant. 'Grand Nain' is solid green in color. They are wind resistant. Zones 8-11. Can grow up to 2' per month. Beautiful plants 12"+ tall shipped. We have only a very few available so we must limit one per address, Thanks. A Super Dwarf banana plant variety that only gets 3' high. Produces excellent dessert type fruit. Great for indoor and. a beautiful potted plant too. Zones 8-11, Nice 12" high plant. 'FHIA-2 Mona Lisa' is a hardy, disease resistant, heat tolerant hybrid banana variety. This Banana plant is fast-growing and a great performer! Fruit has a very pleasant sweet and mild flavor. Can grow: 10 to 12 feet wit good fertilizing practice. Sun: Full Sun, Partial Sun, Plants shipped are 12" high. My Choice of the banana plant for the best edible bananas for your area. Get a 2 month earlier harvest by planting our plants in pots or ground now in February for bananas harvested months sooner. All plants shipped with leaves, fertilizer spikes and we guarantee nice undamaged plants when you get them. Banana Plants also work well as a sound block to prevent the harsh noises of roads, as well as the noxious fumes, from reaching your house. I promise a beautiful Banana plant will arrive, no excuses. I will help you grow them if needed. Fun and Easy to grow and will make you happy with super sweet ripe Bananas! credit, debit cards and also take PayPal. THE TWO DOLLAR MISTAKE. Let me tell you about Ted and his plants. I always shop around and I purchase from two other Company's and when I got my plants all in it was as different as night and day the other plants look sick next to Teds. The others were a joke for the two dollars I save it will take months for the others to look any where next to Teds and they will never catch up!!!! WOW He is a five star rating If you would like to see pics of the plants compare to Ted's email me at pukzpukz@yahoo.com The others don't even come close J D Cameron LA. Our Return policy is Your choice of a replacement or full refund for a shipping damaged plant or any disappointment. 100% Satisfaction Guaranteed! We are a registered mail order Plant Nursery in Melbourne, FL. and try to give 100% Top Quality service. All Plants ship together. 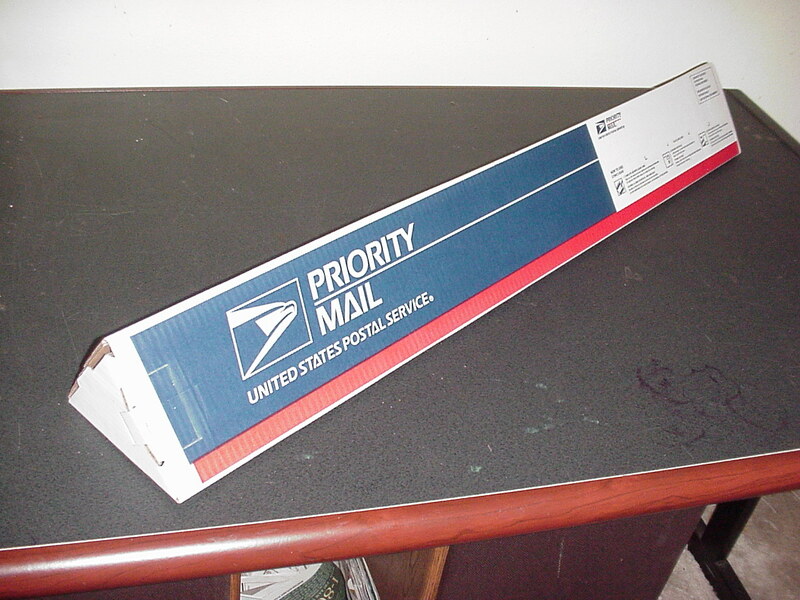 We take all credit and Debit cards and Checks and Postal money orders by USPS. ted@Greenhouse.net I answer them till midnight. Banana plants shipped only in the U.S.A. We sell the easiest banana plants to grow and all can be grown in full sun, part shade or inside your home by a window. All plants are at least 2 months old. Bananas are one of our best sources of potassium, an essential mineral for maintaining normal blood pressure and heart function. Since the average banana contains a whopping 467 mg of potassium and only 1 mg of sodium, a banana a day may help to prevent high blood pressure. Bananas have long been recognized for their antacid effects that protect against stomach ulcers and ulcer damage. Could be World's Healthiest Food. A banana plant takes about 9 months to grow up and produce a bunch of bananas. Then the mother plant dies. But around the base of it are many suckers, little baby plants. At the base of a banana plant, under the ground, is a big rhizome, called the corm. The corm has growing points and they turn into new suckers. These suckers can be taken off and transplanted, and one or two can be left in position to replace the mother plant. You can not grow edible bananas from seeds. Edible Banana plants don't produce seeds. Maintaining your banana patch The most common cause of death for bananas is lack of water. Protect them and feed them and water them and all will be well. Other than that bananas don't need much maintenance. You get bigger fruit if you remove all unwanted suckers, only keeping the best one (two for very healthy, vigorous plants). You just need to sprinkle on some fertilizer every now and then, to replace what you took out of the system when you took the bananas. Keep the fertilizer close to the trunk as bananas don't have a big root system. You may see your first flower emerge after about six months, depending on the weather. Leave the leaves around it, especially the one protecting the top bend of the stalk from sunburn! As the purple flower petals curl back and drop off they reveal a "hand" of bananas under each. Each banana is a "finger". You may get anything between four to a dozen or more full hands. Then, under the next petal, you'll see a hand of teeny weeny excuses for bananas. Those are the male fingers. The male fingers just dry and drop off. Only the stalk remains. If you let it grow it will eventually reach the ground. I never cut the flower off while growing the bananas. The hummers (Ed: hummingbirds) love them too much. I have to keep my hummers happy. Bananas are ready to be picked when they look well rounded with ribs, and the little flowers at the end are dry and rub off easily. They will eventually ripen on the bunch, and those bananas taste the best. But once they start they ripen very quickly, faster than you can eat or use them. So you may as well cut the top hands off a bit earlier and ripen them on the kitchen bench. You can also cut the whole bunch and hang it somewhere if you need to protect it from possums or birds or other thieves. But then all bananas will ripen at once! So be prepared. They make great windbreaks or screens, They can keep the sun of the hot western side of your house, They utilize the water and nutrients in waste drains (think washing water or outdoor shower), the leaves can be fed to horses, cows and other grazers, the dried remains of the trunks can be used for weaving baskets and mats. ..... and they give you bananas. Lots of bananas! How to get started growing bananas. Bananas can handle extreme heat (if they have enough water), but they don't like it. They can handle cool weather for a short while, but they don't like that either. You need very rich soil. If you don't have good soil to start with, make some. Incorporate lots and lots of compost and before you plant your bananas (wood ash for extra potassium doesn't hurt either), and then mulch them very thickly. And keep mulching and feeding them! I have herd this so many times about my Florida competition. I bought some bananas from another Company.in Florida. When they arrived, they were both in distress at best. One was broken in half and half dead. The other was just distressed. Not happy with my purchase with them. Can not even get a hold of them. They don't answer emails etc. I saw that you company had great reviews. Thought that I would give you a try. So far you are way ahead of them. Good luck with business. T.S.-------------------------------------------------------------------------------- Order:	34328 Rating:	Excellent Comments:	Price Rating: Excellent Shipping Options Rating: Excellent Delivery Rating: Excellent Ease Of Purchase Rating: Excellent Customer Service Rating: Excellent Title: Body: Banana trees arrived carefully packed & in great condition. Planted & doing well. ------------------------------------------------------------------------Order: 31090 Rating: Excellent Banana Trees Comments: Price Rating: Excellent Shipping Options Rating: Excellent Delivery Rating: Excellent Ease Of Purchase Rating: Excellent Customer Service Rating: Excellent Title: Body: My banana trees were shipped in a very timely manner and were healthy. Greenearth has given me excellent quality banana trees and customer satisfaction. -------------------------------------------------------------------------------- Order: 30734 Rating: Excellent Banana Plants Comments: Price Rating: Excellent Shipping Options Rating: Good Delivery Rating: Good Ease Of Purchase Rating: Excellent Customer Service Rating: Excellent Title: Body: I ordered two different types of banana trees. These banana trees were packaged well and the were very healthy plants. I was so pleased with the outcome I will order from this merchant again. 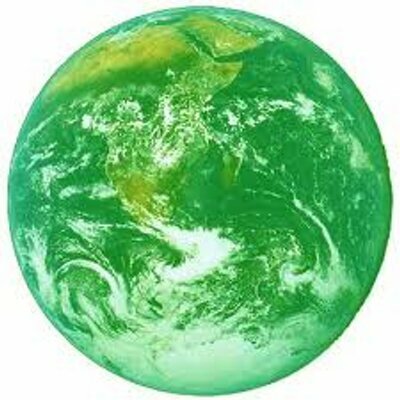 Thank You Greenearth for being professional and for not being like the others. -------------------------------------------------------------------------------- Order: 30723 Rating: Good Comments: Price Rating: Excellent Shipping Options Rating: OK Delivery Rating: Good Ease Of Purchase Rating: Excellent Customer Service Rating: Excellent Title: Body: This is an update of a review I wrote a few days ago. I received my banana trees. They are 3 times larger than I expected and very healthy. They are excellent for the price. Thank you, Mr. Taylor. -------------------------------------------------------------------------------- Order: 30326 Rating: Excellent Comments: Price Rating: Excellent Shipping Options Rating: Excellent Delivery Rating: Excellent Ease Of Purchase Rating: Excellent Customer Service Rating: Excellent Title: Body: Great service! Even though he said he was very busy and it may be a week to get the Banana plants, they came in 3 days! The Banana plants are beautiful. -------------------------------------------------------------------------------- Order: 30096 Rating: Excellent Comments: Price Rating: Excellent Shipping Options Rating: Excellent Delivery Rating: Excellent Ease Of Purchase Rating: Excellent Customer Service Rating: Excellent Title: Body: Excellent company to do business with! Very quick and customer oriented. Quality products! -------------------------------------------------------------------------------- Order: 29366 Rating: Excellent Comments: Price Rating: Excellent Shipping Options Rating: Excellent Delivery Rating: Excellent Ease Of Purchase Rating: Excellent Customer Service Rating: Excellent Title: Body: The entire shopping experience was a pleasure. I received the Ghost chili pepper seeds quickly. I've just planted them, so I'm hoping to have peppers by the end of August, maybe September. I'll leave more feedback later on. -------------------------------------------------------------------------------- Order: 29297 Rating: Excellent Banana trees Comments: Price Rating: Excellent Shipping Options Rating: Excellent Delivery Rating: Excellent Ease Of Purchase Rating: Excellent Customer Service Rating: Excellent Title: Body: i am very pleased with this company. My order was accurate, arrived fast and as promised and they took good care in packaging my bannana plant so it arrived undamaged from across the country. Great experience and product as my tree is doing very well thanks to the enlosed instructions/tip sheet. Thank you!!!! -------------------------------------------------------------------------------- Order: 29122 Rating: Excellent Comments: Price Rating: Excellent Shipping Options Rating: Good Delivery Rating: Excellent Ease Of Purchase Rating: Excellent Customer Service Rating: Excellent Title: Body: I ordered some Trinidad Scorpion pepper plants. They came wrapped in newspaper and in a very strong cardboard mailer tube. Upon opening, the plants were wilted and the dirt was bone dry. I thought about returning them, however, plants are very resilient. I planted them in a quart pot and placed them outside. I have watered them every day in a medium draining soil/peat mix with 5-10-5 fertilizer. It has been 1 week since they arrived and the plants are doing great! Most of the original leaves have fallen off, however, there are approx 10 new leaves growing on each plant at this moment. I can't wait for the peppers! -------------------------------------------------------------------------------- Order: 28874 Rating: Excellent Comments: Price Rating: Excellent Shipping Options Rating: Excellent Delivery Rating: Excellent Ease Of Purchase Rating: Excellent Customer Service Rating: Excellent Title: Body: Very healthy plants with quick shipping. I couldn't be more pleased. -------------------------------------------------------------------------------- Order: 28842 Rating: Excellent Comments: Price Rating: Good Shipping Options Rating: Excellent Delivery Rating: Excellent Ease Of Purchase Rating: Excellent Customer Service Rating: Excellent Title: Body: Hello . I bought 7 different bananas trees at once, which arrive safely and well wrapped in a US postal box. I am very happy with my first purchase and might even buy some more in a near future. -------------------------------------------------------------------------------- Order: 28808 Rating: Excellent Comments: Price Rating: Excellent Shipping Options Rating: Excellent Delivery Rating: Excellent Ease Of Purchase Rating: Excellent Customer Service Rating: Excellent Title: Body: I am very satisfied with my purchase. 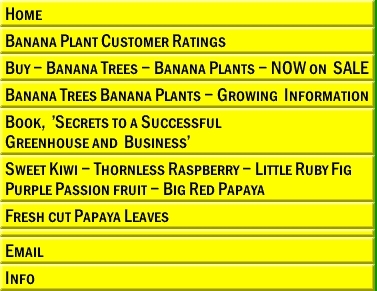 I bought 2 banana trees a Texas and California Gold which are recommended for my USDA zone 7. They arrived nicely package with care and had no damage to the leaves. The Banana Trees are already growing and are very healthy.